There are now three wineries in or near Creston, the Kootenay city previously known just for the Columbia brewery and general agriculture. With a population of 5,300 (2011 census), Creston has been growing out of the down-at-the heels personality it had as recently as a decade ago. There is, for example, a well appointed new Ramada Inn to accommodate visitors far better than the old motels favoured by tree planters. Perhaps the wineries have played a role in this revival, as tourists passing through on the way to the Okanagan discovered it was worth their while to stop and taste Creston’s well made wines. I have recently been able to taste wines from two of the three. Baillie-Grohman Estate Winery is the only one of the three which distributes its wine outside the Kootenays. To acquire the wines of Skimmerhorn Winery or Wynnwood Cellars, it is necessary to visit Creston. If you do, Skimmerhorn has a good summer-season restaurant. 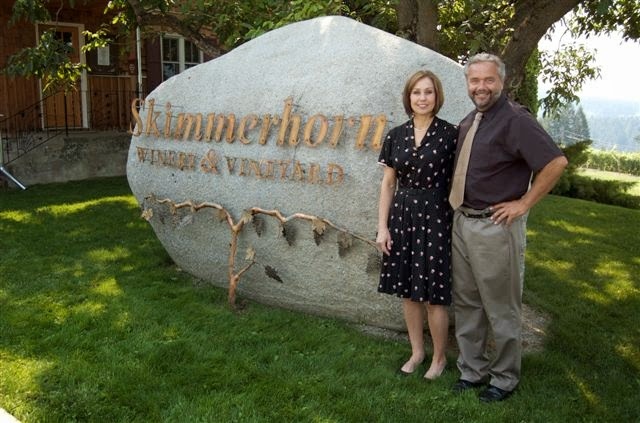 Skimmerhorn, which opened in 2006, was the first Creston winery. Owners Al and Marleen Hoag (who have the winery for sale now) found a clever way to overcome the lack of winemakers in Creston. They went to New Zealand and found Mark Rattray, a veteran winemaker who agreed to do vintages in British Columbia when wineries in the southern hemisphere are not busy. Bob Johnson (right) and Petra Flaa opened Baillie-Grohman in 2010 across the street from Skimmerhorn. They recruited a New Zealand winemaker named Dan Barker, the owner of well-regarded Moana Park Winery in Hawkes Bay. He was New Zealand’s Young Winemaker of the Year in 2003 and has picked up more than 250 awards since then. Both he and Mark got their Creston winery clients ably launched. Wynnwood Cellars began selling wines in 2012. The partners here are Michael Wigen (left) and Dave Basaraba. The Wigen family has been in the Creston area since 1892 and Michael now is an executive in the family business, Wynndel Box & Lumber Company. Dave is from Walla Walla in Washington but has lived in the Creston area since 1987. He broached the idea of growing grapes to Michael. The partners, after starting the vineyard in 2007, opened the winery north of Creston beside Highway 3A. Chances are those drivers welcome a glass of wine in Creston at the end of such an exhilarating drive. Baillie-Grohman Récolte Blanc 2013 ($17). The name means harvest white. It is a tasty aromatic blend of Pinot Gris, Gewürztraminer and Schönburger. It begins with floral and tropical aromas and delivers flavours of green apple, melon and citrus. The racy acidity makes for a crisp and tangy lemony finish. This would be especially refreshing as an aperitif. 88. Baillie-Grohman Gewürztraminer 2013 ($19). Sometimes, wines from this varietal will surprise you by developing over two or three days after the bottle has been opened. This had an appealing spicy aroma and flavour, along with vivid grapefruit tastes, on first being opened. Over the next several days, the bottle came out of the fridge for another glass. Each one was fuller on the palate, with more herbs and grapefruit. I wish I had had a magnum. 89. Baillie-Grohman Pinot Gris 2013 ($20). This is a juicy expression of the variety, with aromas of tropical fruits and flavours of peaches, apples and grapefruit. 90. Baillie-Grohman Blanc de Noirs Rosé 2013 ($19). Here is a summertime charmer if I ever tasted one. It begins with dramatic aromas of cherries and strawberries, with a juicy palate that delivers a fruit bowl of flavour. The wine is well balanced, with just enough residual sugar lift all that exuberant fruit. 90. Baillie-Grohman Pinot Noir 2011 ($25). This medium-bodied wine might fairly be described as feminine, with easy appeal. There are notes of strawberry in the aroma and spicy cherry flavours. The texture is silky. 88. Baillie-Grohman Merlot Cabernet Sauvignon 2011 ($25). The grapes for this blend are from a vineyard in the Similkameen Valley. The wine’s soft, ripe tannins make it very drinkable in its youth. There is a core of black cherry and vanilla on the palate with black currant and spice on the finish. 89. Wynnwood Cellars Sauvignon Blanc 2012 ($21.95). This is a crisp and tangy wine, with aromas and flavours of lime and lemon, a fine spine of minerals and racy acidity on the finish. 87. Wynnwood Cellars Chardonnay 2011 ($22.95). Nothing on the back label indicates whether this wine is unoaked or barrel aged. The generous texture suggests either time in neutral barrels or good lees work. Yet the wine still manages to be fruit forward in a restrained way, with aromas and flavours of apple and citrus. 88. Wynnwood Cellars Pinot Noir 2011 ($23.95). The winery has four clones of Pinot Noir in its main vineyard – clones 114, 115, 667 and 777 – which displays a commendable commitment to the varietal. While the aroma displays the funkiness that nerds call barnyard, there are good black cherry flavours. The tannins are firm and I would recommend aging this wine a few more years. 87.